When a traffic stop ends in a DUI arrest, the arresting officer will write a police report for the incident, detailing what occurred during the stop and arrest. Because police reports can provide important evidence for a future DUI defense case, below, we will point out some of the most important facts to understand about DUI police reports. When, however, you need the strongest defense against misdemeanor or felony DUI charges, it is time to contact a Denver & Boulder DUI attorney at the Griffin Law Firm. These facts about DUI police reports are important for people accused of drunk driving to understand, a Denver & Boulder DUI attorney explains. Here’s why. The details in these reports – Generally, police reports for DUI arrests should document what the probable cause was for the traffic stop and what occurred once the motorist was pulled over by the officer. Details regarding the driver’s general appearance, whether (s)he submitted to field sobriety testing (and, if so, the results of this testing) and whether (s)he submitted to BAC testing (and the type and results of this testing) should also be spelled out in an official police report for a DUI case. 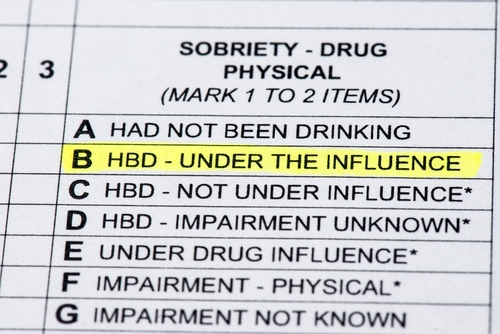 The info in police reports can help a defense case – Based on the above information, DUI police reports clearly can serve as roadmaps for prosecutors’ cases. However, these reports may also be critical to the defense in that they can reveal if or when an officer may have failed to follow proper procedure during the DUI stop and/or may have violated the rights of the accused in any way (both during the stop and the arrest). In fact, just a few of the factors in police reports that have the potential to bolster a DUI defense case include a lack of probable cause for the stop, an officer using a non-approved breathalyzer device and/or an officer failing to wait at least 20 minutes before administering BAC testing (after pulling the motorist over). Availability of DUI police reports – Typically, it will take a least a week or two following a DUI arrest for the official police report to become available. Once it is ready, however, copies of the report will usually be available (upon request) to the accused and/or his or her legal team. How to get a copy of a police report for a DUI case – Different jurisdictions have different procedures for requesting and obtaining copies of police reports for DUI cases. In Denver, these requests can be made online, via mail or over the phone. In Boulder, requests for DUI police reports can be made via mail or fax. For the best possible defense against any type of DUI charges in Colorado, contact an experienced Denver & Boulder DUI attorney at Griffin Law Firm. With more than 18 years’ experience in the criminal justice system, our attorney understands the complexities of the system, the challenges different defendants can face and the best ways of overcoming these challenges to bring criminal cases to successful resolutions.